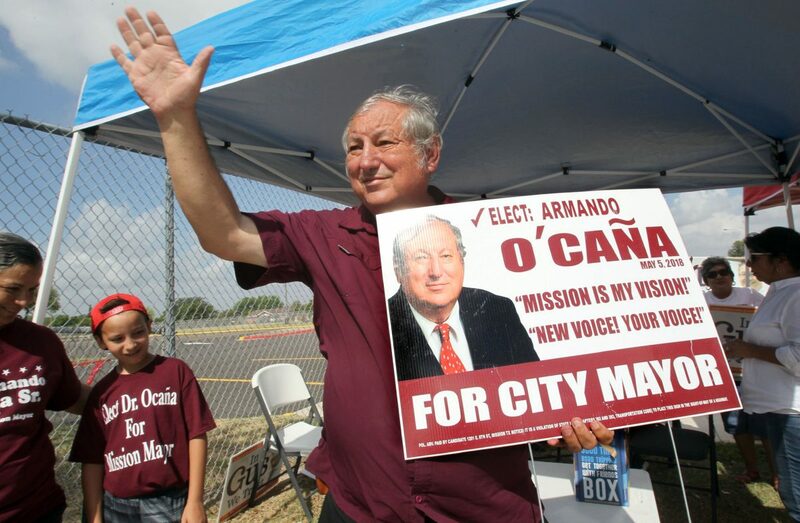 Armando O'Caña waves to voters during run-off elections for mayor for the City of Mission Saturday, June 9, 2018. An appeals court sided Friday with current Mission Mayor Armando O’Caña to overturn an October 2018 ruling that voided the mayoral runoff election, in which he unseated Norberto “Beto” Salinas as mayor after 20 years in office. The 13th Court of Appeals disagreed with Judge J. Bonner Dorsey, who after a nearly two-week-long trial ruled that it was impossible to determine the true outcome of the runoff election and ordered a new election to be held. That order was stayed while the case was appealed. After coming in second behind Salinas in the May general election, O’Caña was victorious during the June runoff with 3,475 to 3,318 votes, according to the official canvass. An election contest filed against O’Caña followed, alleging illegal vote harvesting and bribery by his campaign. The trial, which concluded Oct. 5, included testimony from voters who alleged they were illegally assisted and a few who claimed they were paid for their votes. O’Caña’s attorneys attacked the credibility of the voters and argued that even if their testimonies were true, they were not sufficient in number to have affected the outcome of the election. The appellate court appeared to agree, not finding sufficient evidence to justify holding a new election. To expedite the process, the justices ruled that no motion for a re-hearing will be entertained. Friday’s ruling, though, is unlikely to be the final word on the matter as the attorneys for Salinas are expected to appeal the decision.